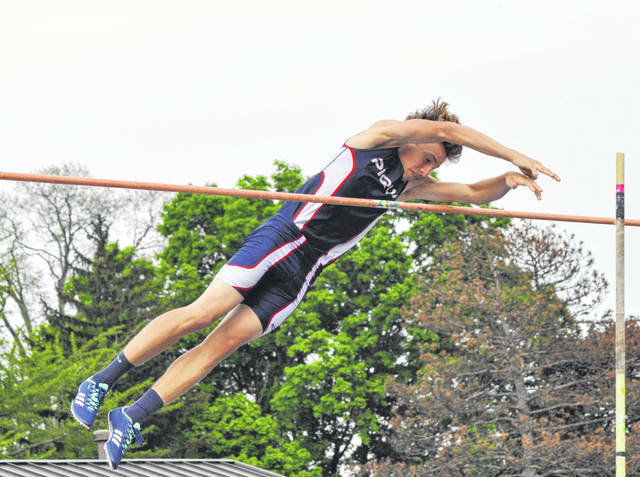 Rob Kiser|Miami Valley Today file Piqua pole vaulter Jackson Heitkamp clears the bar at the GWOC meet last year. He is back for his senior season. Mike Ullery|Miami Valley Today file Houston state qualifier Tristin Freistuhler returns for the Wildcats. David Fong|Miami Valley Today file Miami East’s Blaine Brokschmidt clears the bar in the pole vault during last year’s state meet. 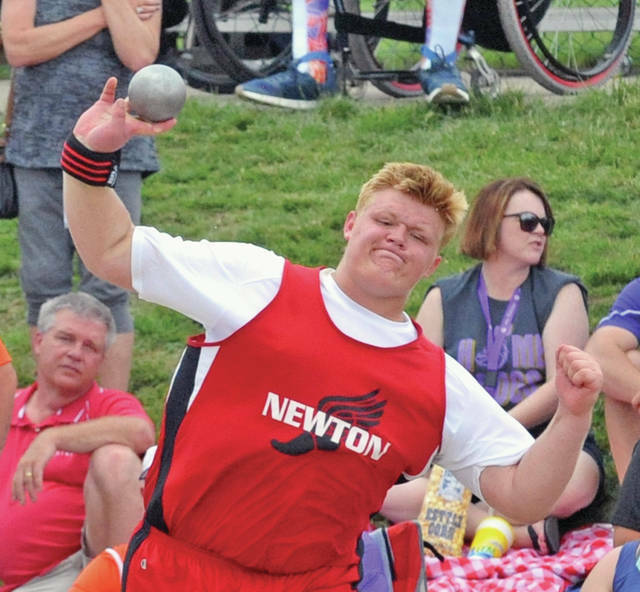 Josh Brown|Miami Valley Today file Newton’s Dawson Hildebrand throws the shot put at last year’s state meet. 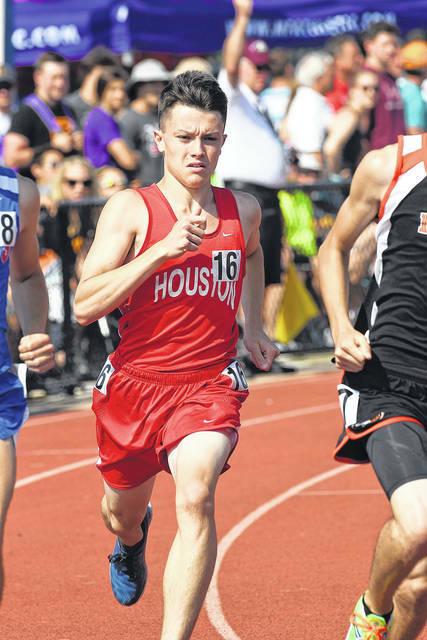 Josh Brown|Miami Valley Today file Milton-Union’s Robbie Grove, Miami East’s Justin Brown and Newton’s Ethan Cook race to the finish line during last year’s Miami County Championships meet. Piqua coach Scott Kaye returns to lead an Indians boys track and field team that boasts enough returning experience to make Kaye hopeful that the team can move up in the Greater Western Ohio Conference American North Division standings as it enters the final season in the league. Graduating off last year’s team was Jacob Bushnell (sprints and relays). Returning letterwinners include seniors Coeby Patton (hurdles, relays) and Jackson Huelskamp (pole vault); and juniors Matt Blankenship (hurdles, relays) and Mitch Fletcher (distance races, relays). Kaye looks for improvement in the GWOC. The Buccaneers lost a lot of firepower from a team that was CCC and district runners-up a year ago, but coach Kyle Moore’s squad still has plenty leftover to take aim once again. Graduating off that team were Jett Murphy, Cade Harshbarger, Ethan Herron, Zach Parrett, Nathan Lyle and Ty Freeman, who combined to score a number of points at the state meet last year. Returning letterwinners include seniors Hunter Alexander, Tyler Fraley, Gray Harshbarger and Sam Pritchard; juniors Andrew Cates, Fletcher Metz, Kadin Presser, Cade Schmelzer, Dalton Weer and Alex Shaffer; and sophomores Duncan Cooper, Logan Lowe, Deacon Shields and Bennett Welborn. Moore expects to be a balanced team. In taking over for long-time coach Bob Crawford, Tippecanoe coach Nick Culver has high hopes for the Red Devils this season. The distance runners will likely lead the way for the Devils, as junior Bryce Conley returns after winning a district title in the 3,200 last year, with senior Noah Ballard, junior Brennan Larned and sophomore Patrick McCaffrey adding depth to the lineup. The sprints are wide open at this point with the high number of new runners out, but junior Corey Abney and freshman Blake McCullough could lead the way, as may senior Bryce McCullough as he makes his way back from a football injury. McCullough will also throw the shot put, and junior Jake Rowland was a district qualifier in the high jump last season. Milton-Union’s boys enter the season as the defending Southwestern Buckeye League Buckeye Division champions, and the Bulldogs are looking to keep it that way. The Bulldogs have a host of returning talent to help them do just that, too. Seniors Robbie Grove, Dalton Hetzler and Duke Sager return in the sprints, and senior Harrison Litton, junior Tristan Persinger, sophomore Chris Miller and freshman Eric Trittschuch will lead the way in the middle-distance and distance races. Miller will also compete in the long jump, Jake Palmisano will high jump, sophomore Mason Gooslin will compete in the throws and freshman Carter Tinnerman will pole vault. As Miami East coach Steve Karnehm enters his 11th season with the team, the Vikings will be preparing for what may feel like two different season crammed into one. “We compete in two different track environments,” Karnehm said. “The Cross County Conference is very competitive, and this year both Covington and Twin Valley South will be contending to try to keep us from repeating as champions. And in the postseason, we moved up to Division II last year, so a whole different group of schools are present as competitors in our district meet, where we were third. Leading the way for the Vikings is two-time state placer senior Blaine Brokschmidt in the pole vault, who just finished third at the state indoor meet. Brokschmidt can also compete in the throws and relays, and fellow senior Justin Brown will leada deep sprinting corps, as well as the high jump and long jump. Gavin Horne and Greg Austerman will also lead a deep group of distance runners, and seniors Ryan Teale — another state indoor qualifier — and Brenden Dalton will head up the throwers. Bethel boys track coach Mark Clute wants to see his team keep moving in the right direction as he enters his fourth year at the reins, aiming to have his Bees peaking come the postseason. 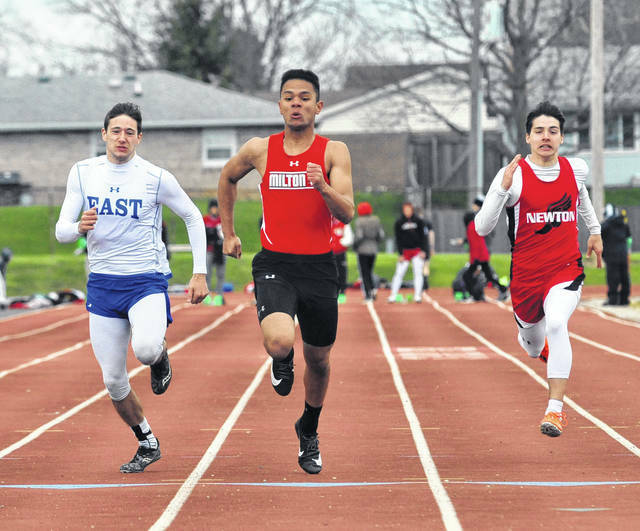 Junior Wyatt Leet ran times in the 55s in the 400 last year and will look to lead the sprinters, and Leet also teamed up with juniors Keaton Smith, Colton Smith and Tristan Johnson to qualify for the regional in the 4×200 relay last year. Sophomore Cole Brannan also returns in the distance races this season. Newton returns plenty of firepower this season — including a number of state qualifiers — and will be looking to make some noise in the Cross County Conference and beyond. Sophomore Dawson Hildebrand not only won a CCC and district championship in the shot put during his freshman year, but he placed fourth at the state meet. Other league champions in the field events included juniors Ethan Cook in the long jump and Cameron Stine in the high jump. Cook is a two-time regional qualifier in the sprints, as well, and Stine is a state qualifier in the hurdles and high jump. And in the distance races, freshman Ben Hoover looks to make an immediate impact after a solid cross country season and placing fourth in the state junior high meet in the 1,600 last year. After finishing in the middle of the pack at the Metro Buckeye Conference meet last season, Troy Christian’s boys are looking to contend for a title this year. “With the depth we are gaining in covering events, we will be working to bring home the MBC team title this year,” said Troy Christian coach Jeff McDaniel, who will be in his sixth year with the team. Senior Nick Pratt and junior Robert Ventura will lead the way from the distance races after qualifying for the regional last year, while Ventura and fellow junior Aiden Tkach will also look to improve in the middle-distance races. Senior Harrison Hartman is back for his second season as a sprinter, joining juniors Jaylen Hudgins and Preston Lair, who will both be out for the first time. And in the throws, Hartman and fellow seniors Luke Ruffing and Michael Whidden will be looking to advance to the regionals this season. Ron Boeke returns for his 33rd season as coach. The Wildcats were third in the SCAL and at the district meet last year and eighth in the regional. Graduating off that team were James DiLullo, Dan DiLullo, Christian Jenkins, Parker Cox, David Stammen, Dakota Francis and Cameron Via. Ethan Knouff, who also qualified for state in the 800 and Tristin Freistuhler and Blake Jacobs return off the 3,200 relay team that qualified for state last year. Also returning are Jacob Slater, Dominic Beaver, Tyler Kies, Liam McKee, Joe Earl, Amin Waters and West Jester. “With 10 lettermen returning from last year, we should be strong in distance events and weak in sprints,” Boeke said. He expects the SCAL to be as strong as ever. Dwane Rowley returns for his 10th season as coach. Graduating off last year’s team was regional qualifier Owen Smith. Returning letterwinners include juniors Brendan O’Leary, Chris Goettemoeller and Matthew McDonald and sophomores Scott Peterson and Andrew Wiseman. Dan Schafer returns as coach. Russia finished fifth at the SCAL meet a year ago. Graduating off that team were Xavier Cordonnier, Michael Ditmer, Matt Siefring, Zach Bell and Levi Lavy. Returning letterwinners include Max Bohman, Dawson Luthman, Alex Seger, Andrew Deloye, Jake Goubeaux, Lee Magoto, Jason Siefring and Michael York. Schafer hopes to improve on the Raiders fifth-place finish in the SCAL last spring. Michael Paulus takes over as coach. The Tigers were MAC champion, as well as district and regional runnerup. Graduating off that team were A.J. Ahrens, Adam Gehret, Mitchell Huelskamp, Kyle Jones, Nathan Nelson, Luke Shellhaas, Joe Spitzer and Josh Steinbrunner. Returning letterwinners include Brooks Blakeley, Cole Luthman, Stuart Baltes, Cade Schulze, Ben Alberts, Brian Heitkamp, Ben Rose, Luke Billenstein, Wesley Bruns, Matthew Cromwell, Chase Detrick, Caleb Heitkamp, Troy Jones, Owen Schulze and Ryan Subler. “We lost a lot from our group of seniors,” Paulus said. “We will have a young team as 27 of our 40 boys will be freshman and sophomores. We are looking for growth out of our young team. Paulus is shooting for a top-four finish at the MAC meet. Contact Piqua Daily Call Sports Editor Rob Kiser at rkiser@aimmediamidwest.com. Contact Troy Daily News Sports Editor Josh Brown at jbrown@aimmediamidwest.com, or follow @TroyDailySports on Twitter. https://www.dailycall.com/wp-content/uploads/sites/30/2019/03/web1_jackson.jpgRob Kiser|Miami Valley Today file Piqua pole vaulter Jackson Heitkamp clears the bar at the GWOC meet last year. He is back for his senior season. https://www.dailycall.com/wp-content/uploads/sites/30/2019/03/web1_tristin.jpgMike Ullery|Miami Valley Today file Houston state qualifier Tristin Freistuhler returns for the Wildcats. 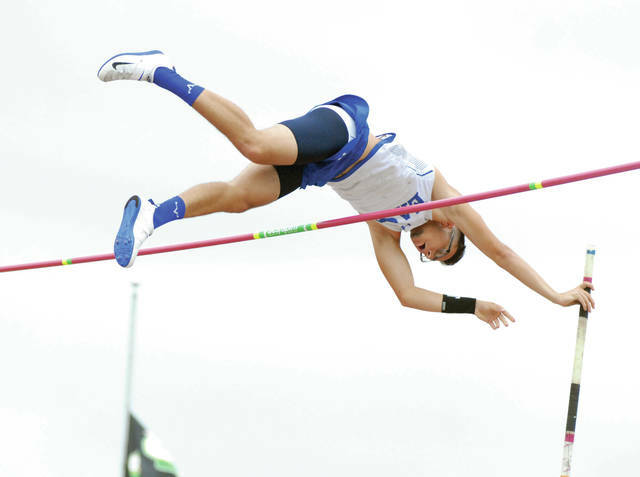 https://www.dailycall.com/wp-content/uploads/sites/30/2019/03/web1_060118df_me_brokschmidt.jpgDavid Fong|Miami Valley Today file Miami East’s Blaine Brokschmidt clears the bar in the pole vault during last year’s state meet. https://www.dailycall.com/wp-content/uploads/sites/30/2019/03/web1_060118jb_new_hildebrand.jpgJosh Brown|Miami Valley Today file Newton’s Dawson Hildebrand throws the shot put at last year’s state meet. https://www.dailycall.com/wp-content/uploads/sites/30/2019/03/web1_041718jb_mu_grove_me_brown_new_cook.jpgJosh Brown|Miami Valley Today file Milton-Union’s Robbie Grove, Miami East’s Justin Brown and Newton’s Ethan Cook race to the finish line during last year’s Miami County Championships meet.